What if you knew exactly what Jesus wanted you to look like? I’ve grown up in church, so these are not unfamiliar to me. But my recent encounter with these Beatitudes has reminded me of an important truth as it relates to the Bible. Scripture is alive and active, and so are we. Because of that, anything can happen when we come to the Bible with fresh and expectant eyes. And that’s what has happened to me. The Beatitudes is a description of the person “blessed” by Christ. It carries within it eight* characteristics or fruits: poorness of spirit; mourning/lament; meekness; hunger/thirst for righteousness and justice; mercy; purity of heart; peacemaking; and courage under the fire of persecution. There will always be a debate about what exactly it means to be “blessed.” Some throughout history have read that as a call to action – in other words, if we want to be blessed by God, we need to improve in those eight areas. But that seems to clearly miss the point, in my humble opinion. Life in Christ is built off of grace, and grace never requires us to do anything to earn God’s love. That is why I am on the side of those who interpret “blessed” as a synonym for grace. In other words, those who have experienced the grace of God are by definition blessed. And those who are blessed are “in Christ,” which is how the Apostle Paul describes it most often. And those who are blessed, and who are in Christ, are therefore by definition carriers of these eight fruits known as the Beatitudes. Much can be said about the Beatitudes – in fact, much has indeed been said. I can’t remember a sermon topic in the last couple of years that required so much reading and research. Volumes and volumes have been written on these. What has jumped out to me though, and what I want to strongly emphasize in this post, has been this: The Beatitudes represent Jesus’ vision for humanity. The eight fruits that comprise the Beatitudes – these are the master blueprint. These eight characteristics describe the core character of someone shaped by the life of Jesus Christ. They are the raw material that Jesus shapes and molds and transforms as he builds us into full fledged disciples. Or maybe I could say it in a different way. If we hope to see all the fullness of God, then we are to look at the human person of Jesus (that’s what Paul says in Colossians 2.9). But what if what we hope is to see all the fullness of Jesus – where then would we look? Could there be a clearer answer to that than the Beatitudes? This seems so straightforward, and yet it has never dawned on me before this moment. There are so many elements that come into play when we talk of spiritual maturity, Christian discipleship, and a full fledged life in Christ. But as I’ve reflected on the many sermons I’ve listened to, books I’ve read, and conversations I’ve had about what spiritual maturity looks like, I can’t recall one of them that centered the Beatitudes as the starting point. And I can’t figure out why I and others have missed this so often. As I prepared to teach on this last week, I had a powerful memory come up during a time of prayer. I remembered sitting with a new Christian, talking about the topic of spiritual transformation. He had just taken his first communion, and he was feeling great about this experience. But there was still a fog that hovered around him as to what life in Christ was going to really mean. He had all kinds of questions about the conduct expected of him, the service required of him, and what it would mean to actually walk with Jesus. I also remember (unfortunately) stumbling my way through the conversation. I had so much trouble communicating a cohesive vision of life in Christ. It felt like I was doing a real time cut-and-paste of all the different things I had been taught through the years of what it means to be a spiritually mature Christian. The poor guy had no idea how to synthesize all the various and seemingly unrelated tidbits that I shared. There is no place in the Bible where Jesus more comprehensively and cohesively describes the outcomes of life with him. There is no teaching from Jesus that synthesizes the multiple dimensions of spiritual maturity better than this. Why don’t I, and why don’t we instinctively start here when talking about spiritual transformation? These eight, incredible fruits of the Beatitudes come straight from the mouth of Jesus. It was also at this point that it began to dawn on me how significant this conversation must have been for the disciples. They had given their lives over to Jesus the Rabbi, and had sworn full allegiance to him. But what did that actually mean? Where were they going? Who were they to become along the way? Many of these questions would be answered only by faithful following throughout the course of their lives. But Jesus gave them this tremendous gift at the beginning of the voyage. He shared the inner workings of his mind He gave them a blueprint outlining the characteristics that would define them as they experienced spiritual transformation. He cast a vision for what kinds of seeds had been planted in their soul, and what those would look like as they bloomed into full maturity. Jesus told the disciples exactly what he intended to produce within them. As they experienced the “blessing” of his grace and power, they were going to reflect these eight characteristics. The Beatitudes truly are a blessing. They bring us into the heart and mind of God. They give us a vision for what Christ is doing in our life. They describe the core virtues that are meant to emanate from our very being. Reflecting on the Beatitudes has been a gift, and has ignited a new level of hunger and thirst within me to live fully into these blessings. I pray that they do the same for you! 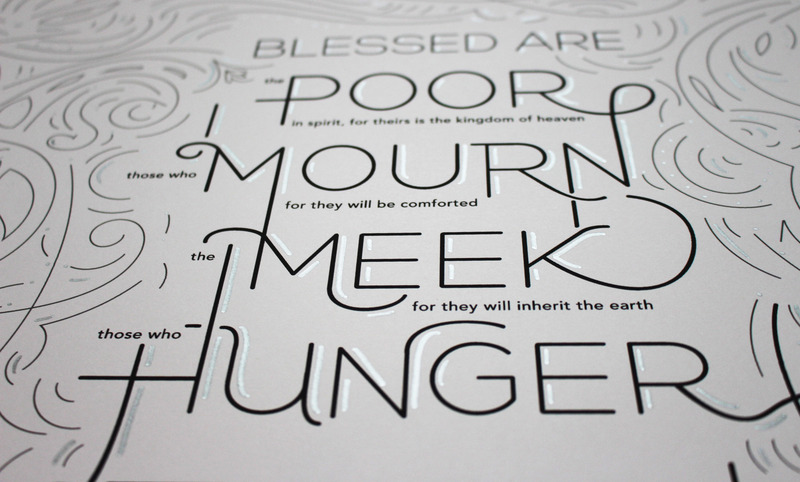 Hi Daniel, where can I find a print of this post’s featured image of the Beatitudes?